Originally published in the North Island Gazette November 3, 2011. In 1925 a small oily fish, known as sardines or pilchard, started to appear off of the West Coast of Vancouver Island. Fishing companies scrambled to establish reduction plants (where the fish were rendered for their oil) and canneries in order to harvest these fish. 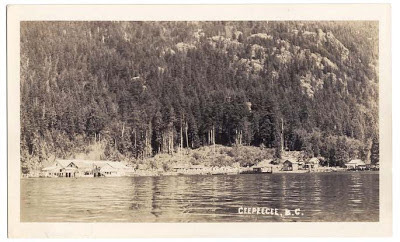 The future site of Ceepeecee was selected for the site of a fish plant due to its sheltered bay and year-round fresh water supply. Local William R. Lord, who was the son of the original owner of the Nootka cannery, staked a claim to the site and then sold it to the Canadian Packing Corporation, a subsidiary of the California Packing Corporation (C.P.C.) who built a plant to process pilchards in 1926. Ceepeecee got its name when the locals made a request for a post office, and in the ‘official name’ section of the form spelled out the phonetic sound for the initials - C.P.C. In 1938 a ship, the Western Packer, blew up at the dock in Ceepeecee. She sank as soon as she was towed away from the dock. One person was seriously injured. 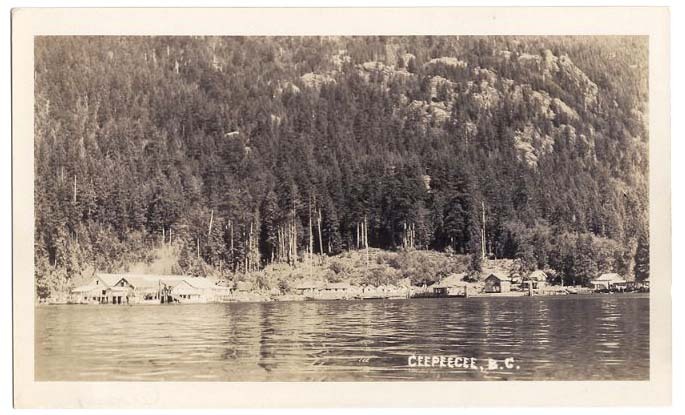 Ceepeecee boasted not only a cannery but a reduction plant, VIP rooms, a two storey staff house, a number of houses and apartments for married couples, bunkhouses, a first aid station and a cookhouse. Eventually they also added many docks, a recreation hall, and a marine ways, and a store. When the Princess Maquinna arrived twice a month tourists would have to negotiate their way down a walkway between the cannery and past the reduction plant in order to get to the local store. When the pilchard arrived in local waters, boats would pull in to the wharf heavily loaded with fish. A bucket-conveyer system would be lowered down to the boat, and men with shovels on the deck would load the fish onto the conveyer system. The boat would be quickly washed down and the boat reloaded with fuel and supplies, and the fishermen would be ready to head out again. Fishermen and off-loaders were paid a ‘per ton’ rate. In the course of a season thousands of tons of fish would be processed through the plant. In the 1940s the pilchard left as suddenly as they came, and in 1951 the cannery closed its doors. In 1956-57 a large fire destroyed much of what was left of the cannery. A marine repair shop and sportfishing lodge both used Ceepeecee as a base in more recent years.